Zanzibar is a semi-autonomous part of the United Republic of Tanzania, in East Africa. It comprises the Zanzibar Archipelago in the Indian Ocean, 25–50 kilometres (16–31 mi) off the coast of the mainland, and consists of numerous small islands and two large ones: Unguja (the main island, informally referred to as Zanzibar), and Pemba. Zanzibar was once a separate state with a long trading history within the Arab world; it united with Tanganyika to form Tanzania in 1964 and still enjoys a high degree of autonomy within the union. The capital of Zanzibar, located on the island of Unguja, is Zanzibar City, and its historic center, known as Stone Town, is a World Heritage Site. 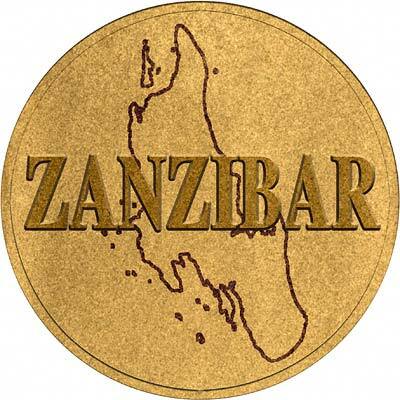 For silver and base metal coins of Zanzibar, please look at our original Chard Coins website. We make an active market in almost all world coins, gold or otherwise, including Zanzibar gold coins. If you have any of these coins to sell, please contact us, or post them to us for appraisal and offer.